I'm not crafty, but I saw this in my head and had to make it real. 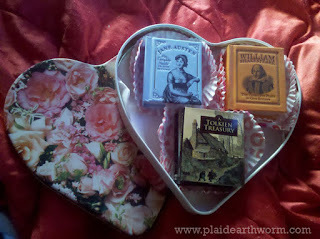 What could be better than chocolates for Valentine's Day? A heart-shaped tin of books! Like the best chocolate samplers, there's a hidden layer: under Tolkien is a tiny edition of John Grogan's BAD DOGS HAVE MORE FUN, just to throw in some extra sweetness. You gotta hand it to zombies; they just won’t die. For years I’ve heard that zombies are out, they’re done, any projects featuring zombies are the last pathetic gasps of an unfortunate trend. Yet they shamble on in hordes, eating our brains (and our cash) with new books, movies and games. Why? They’re just so damn versatile. You can have your serious, scary zombie fetish with AMC’s The Walking Dead, or lighten up with something goofy and fun like the new #1 motion picture this week, Warm Bodies. I tend to fall with comedy rather than carnage, but the undead can do it all. 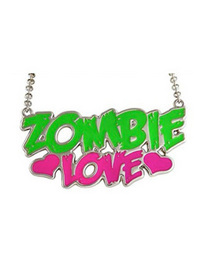 I visited a couple of bookstores this weekend, and both were awash in zombie culture, from undead bling just in time for V-Day (necklace shown is one I spotted at Hastings) to a staggering number of books, including the Art of War for Zombies. Of course, I’m partial to the Zombie Tarot by author Stacey Graham, but even I was truly impressed by the number of books out there. If there’s an established brand or idea, you can bet your brains that a zombie version is out there. Whatever the reason, it looks like zombies have turned from trend to paranormal mainstay. No matter how you prefer them, either comic, romantic or terrifying, stock up on some undead pop culture while you’re filling the basement with cans of mixed vegetables. At this rate, if the zombie apocalypse actually happens, we’re likely to be unimpressed because we’ve already seen it, read it, and bought the bling.